Register for a first order discount to buy this for just £369.55, saving £19.45. 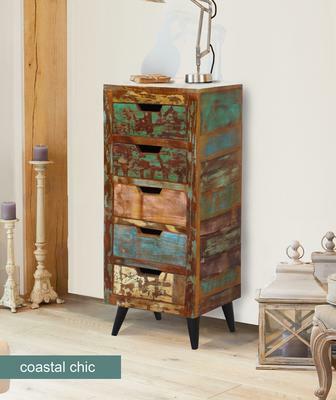 This Coastal Chic 5 Drawer Tallboy provides storage and eclectic style inside your bedroom or living space. The tallboy features a distinct look thanks to the beautiful reclaimed timber used in its construction. The timber wood are sourced from old trawler ships from India. They are about 50 to 150 years old and are extremely durable. The paint chips, dings and bruises are deliberately left in so you can admire the beauty and origin of the piece. You'll find five spacious drawers for storing various items you fancy. Strong iron legs offer support and ensure your tallboy doesn't wobble at all. Use the top surface for holding a lamp or picture frames. You'll love the functional design as well as gorgeous beauty this tallboy offers.